As the popularity of blackjack continues to rise, there are more and more casinos offering mini- and major-blackjack tournaments than ever. If you know the basics of blackjack, you are already well on your way, but knowing some of the basics of tournaments just might help get you to that final seat! This column offers you a guide to follow to make you competitive in your next blackjack tournament. 1. Read the tournament rules. When you arrive at the tournament and get your seat assignment, ask for a copy of the tournament playing rules. Carefully read them before the tournament begins. How much bankroll each player gets. How many hands are played in the round. What the playing rules are, and what a winning blackjack hand pays (in many tournaments it pays 2-1). Whether they have a countdown (meaning, do they stop play, count everyone’s bankroll and announce it, and if so, on what hand does this occur). 2. Always slide all of your chips at once into the betting spot. In tournaments, you are not allowed to take a stack of chips in your hand and drop them one-at-at-a-time inside the betting spot (this is known as a “string bet”). If a player does this, the first chip to hit the felt inside the betting spot will be the player’s wager. To avoid string bets, always stack the chips that you want to bet outside of the betting spot (with highest denomination chip on the bottom and lowest on top), and then slide your stack of chips inside the betting spot. 3. Do not converse with spectators. In many tournaments, you are not allowed to talk to spectators, or communicate with them in any way, or you can be disqualified (and yes, I have observed players being disqualified from tournaments for doing this). In some tournaments, you are not even allowed to converse with your fellow players especially during the final round. You also cannot bring strategy cards or cheat sheets with you when you play, nor ask the dealer for advice on how to play your hand or how much to bet. You are on your own in tournaments. 4. Determine your betting position on the last hand. The first-base position rotates from one player to the next in tournaments. Depending on where the marker is on the first hand (indicating which player is betting first), mentally determine your betting position on the last round. For example, suppose there are six players, you are in seat #2, 30 hands are played in the tournament round, and the player in seat #4 bets first on the first hand. This means on hand #30, the marker will be in front of player #3, who will be the first to bet, and you (in seat #2) will be the last to bet and the last to act. However, keep in mind that the order of betting on the last hand may change if a player busts out (i.e., losses all his chips). If the latter occurs, you need to recalculate where you will be betting on the last hand. As a general rule, if you are going to be “on the button” on the last hand (i.e., betting and acting first), you need to bet more aggressively during the round so that you try to get the lead prior to the last hand (even if it means you must go all in on the next-to-the-last hand). On the other hand, if you are betting last on the last hand, you have a big advantage over your opponents and you can bet more conservatively (at the minimum, you don’t want to be more than one max bet behind the leader going into the last hand). 5. Bet opposite the leader. In the early rounds, if you are behind in chip count, bet opposite the leader. If he bets small, bet big, and vice versa. 6. Match the bets of your opponents if you have the lead (known as correlating). If you are the chip leader and betting last, match the bets that your opponents make in efforts of making it more difficult for them to pass you (if all the players win their hand, or all lose their hand, you maintain your lead). 7. Don’t be afraid to double-down on the last hand. Author Bio: Henry Tamburin, Ph.D. is the author of the Ultimate Guide to Blackjack (http://www.888casino.com/blog/casino-guides/blackjack/, editor of the Blackjack Insider e-Newsletter (www.bjinsider.com), lead instructor for the Golden Touch Blackjack course, and host of smartgaming.com. 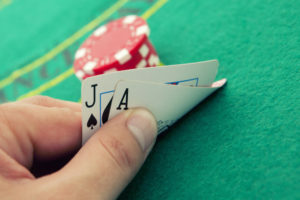 For a free three-month subscription to his blackjack newsletter, go to www.bjinsider.com/freetrial. To receive his free Casino Gambling Catalog, call 1-888-353-3234 or visit www.smartgaming.com.